Photons are a fundamental particle that have no mass and are always travelling at the maximum speed of the universe. They are particles that allow for the electromagnetic force, one of the Four Fundamental Forces of our universe. In other words, they’re pretty important. You probably already know photons by their more common name: light. If you’ve ever seen a shadow, you know that light travels in straight lines. If you’ve ever seen a reflection, you also know that light can bounce. You already know so much about light so let’s kick it up a notch. Photons are some of the weirdest things to talk about because they can be described as both a particle and a wave. Since photons always move at the same speed, their wavelength and frequency are inversely related. 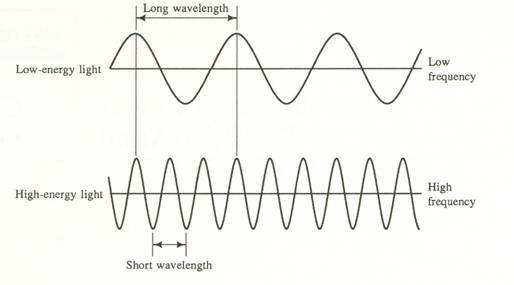 If a photon has a greater wavelength, it has a lower frequency; if it has a very high frequency, the wavelength must be smaller. While photons are always moving at the speed of light, they can carry different amounts of energy, which affects its wave motion. Higher energy photons have higher frequencies, and smaller wavelengths; lower energy photons have lower frequencies and greater wavelengths. To represent all possible energies of photons, we created a spectrum of light. We call it the Electromagnetic (EM) Spectrum and it is one of the greatest discoveries in human history. Radio waves have wavelengths as large as buildings that can move through walls that are thinner than their wavelength. This is why your cell phone gets service even inside, though struggles when underground or in densely built buildings. Microwaves cover a large range but the average wavelength is about the size of an insect. We use these to heat up food because they can vibrate the molecules of water within the food. Infrared waves are about the size of the pin of a needle. We detect these waves through neurons in our skin and we feel it as heat. Visible light is the smallest range of light because it is the only section we can see with just our eyes. These waves are about the length of a single celled organism. Ultraviolet waves are the size of molecules and they are small enough to penetrate our cells and cause mutations to our DNA. Sunscreen is reflective of UV waves but not visible waves, making it invisible when you rub it in. X-rays are about the size of atoms and we can use them to see our skeletal structure. The calcium of your bones is too dense for the X-ray light to pass through so it is reflected back to the sensor, giving the shape of the bone. Gamma rays are about the size of an atomic nucleus and they have enough energy to rip you apart. Luckily, our planet has a churning magnetic core that deflects very high energy waves. Depending on the exact energy of a photon, it can be either reflected or absorbed by the electrons around atoms. If the frequency matches the natural frequency of an atom’s electron, the photon will be absorbed. If it does not match exactly, the photon will either be transferred to a nearby atom or reflected back. The colors we see are the wavelengths of the photons that were not absorbed by the atoms we’re looking at. Plants are green because chlorophyll absorbs blue and red frequencies; the green frequencies are not absorbed and we see the reflected photons as its color. substance, transmitting from atom to atom, the light slows and bends. The lower frequency light bends much more than the higher frequency. This is why a prism makes a rainbow. When the sun sets, the light is bent by the atmosphere. The lower frequency light is bent toward the surface of the planet. This is why sunsets look red and orange. If you’re ever watching a sunset, turn around to see the blue and purple of the other side of the sky. Infrared photons can be absorbed and reflected just like visual photons, we just can’t see what absorbs it. The most common example is the carbon dioxide in our atmosphere. Carbon dioxide acts as a “blanket” for the planet because it reflects infrared photons, also called heat, back toward the planet. Too much carbon dioxide can cause a runaway greenhouse effect while not enough can cause a runaway cooling effect. Your world is absolutely beautiful, and it gains even more beauty when you understand how it works. When you understand your world, you can control your world. Remember to appreciate the beauty that comes with using a fundamental piece of the universe to send a text message, we’ve hacked into our world!